Performers include: David Tennant, Olivia Colman, Jodie Whittaker, Andrew Buchan, Jonathan Bailey, Carolyn Pickles, Matthew Gravelle, Arthur Darvill, Adam Wilson, Joe Sims, Charlotte Beaumont, Simone McAullay, Tanya Franks, Pauline Quirke, Phoebe Waller-Bridge, Charlotte Rampling, Eve Myles, William Andrews, Marianne Jean-Baptiste, James D’Arcy, Susan Brown, Will Mellor, Vicky McClure, Meera Syal, Hollie Burgess, Peter De Jersey, Steve Bennett, Benji Yapp, and Oskar McNamara. This crime drama series revolves around the murder of an 11-year old whose body is discovered on a local beach. Detective Inspector Alex Hardy (David Tennant) is brought in to head up the murder investigation in the small seaside town of Broadchurch. His partner is local Detective Sergeant Ellie Miller (Olivia Colman). The two detectives make a formidable team, although Hardy has a failed investigation in his past that has affected him deeply, and Miller resents having to work with the brusque outsider. A grudging but deep mutual respect develops as they investigate the murder. Miller has to set aside her personal attachments to focus on the case and Hardy relies on her for her intimate knowledge about the local community. The whole town reels with grief, mutual suspicion, and attention from the media. As the detectives collect evidence and interview suspects, some shocking truths are revealed. Danny’s father, Mark Latimer (Andrew Buchan), and his mother Beth (Jodie Whittaker) already have a dysfunctional marriage and they battle to cope with their tragic loss. First aired: August 16, 2017. What do you think? Do you like the Broadchurch TV show? Do you think it should have ended? Would you have liked to see a fourth season? 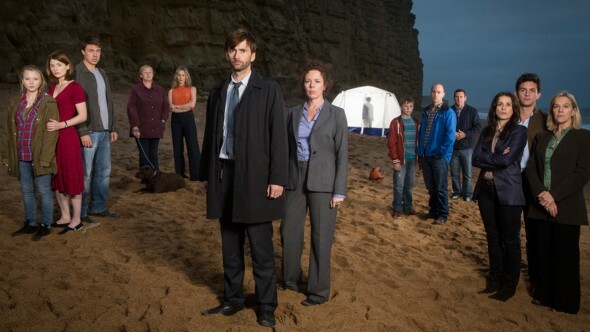 Broadchurch: Cancelled or Season Four with New Showrunner? I think it were awsome amazing & cool show.. I have season 1 & 2 on dvd.. I am a huge “David Tennant ” fan. I loved broadchurch I wish it would have continued. Love it! Amazing characters and story lines so well written and acted Please bring it back! I would absolutely love a season 4! This is such an amazing show! Please bring it back! I liked the Broad Church show, however it stretches the audience’s credulity in the part of the series where an insensitive male detective is given the lead in the show segment on a sexual assault. Having some wanker leading an investigation on sexual assault like this about this type of incident is ridiculous. It would have been more entertaining if the female detective had been given the lead and put the screws to the male detective while he was forced to let her take the lead. You guys must have all male writers on this one. Disappointed series canceled. On of the best! Please! Season 4. DEFINITELY want more… strong characters, original plots… fingers crossed it will be back!! !